A superb guitar that is masterfully built. Design, build, sounds and price! The two Fluence voices are the most subtle here. New technology rarely comes cheap and when Fishman entered the electric guitar pickup market with its Fluence pickups, as retrofits, they certainly seemed on the steep side in terms of price. For example, a set of Fluence single coil-sized ‘single width’ units will cost you £319; a pair of standard humbucking sized pickups start at £359 (neither includes a rechargeable battery pack). If you want to install the Greg Koch signature Gristle- Tone set for a Tele-style guitar, the whole package, including rechargeable battery pack, will cost you £589. John Hornby Skewes (JHS) distributes Fishman products in the UK and is also behind the Trev Wilkinson-designed Fret-King brand. Thanks to its ‘special relationship’, it has somehow managed to utilise this Fluence technology and very thoughtfully include a pretty sharp guitar for sub-£750. Game on! 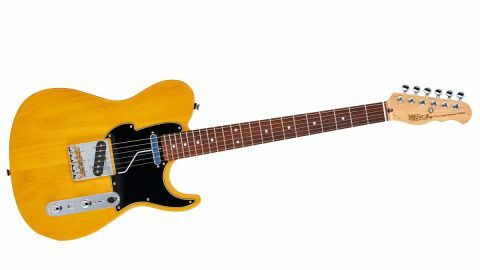 This new guitar in the new Fluence-equipped range typifies what we, and many other players, have been saying for ages: Fret-King makes very good guitars. Indeed, if there were a definition of its Black Label instruments, it might read “nicely made working tools for working musicians”. It ain’t the hippest brand on the block, but its ‘affordable boutique’ marketing tag is accurate, as we see here. The Country Squire features an alder body/maple neck construction, both with rosewood-only 22-fret ’boards, and only one colour option. While the Country Squire is heavily Fender-derived, it is far from a clone. It has a ‘modernised’ body outline: the base is slightly offset and the shoulder more rounded, its curve flowing rather smartly into the single-cutaway. Its thick neck heel extends under the neck pickups, very similar to PRS’s set-neck or bolt-on guitars; the screws sit in separate recessed ferrules. The pair also has open swimming pool routes under the scratchplate, which means any combination of pickups could be fitted without any additional routing. The Country Squire adds nicely compensated and chunky brass saddles to its full-walled Tele-style tray. Now, the trickery lies in the ‘single width’ pickups. Irrespective of their size, they’re humbuckers - the single widths use stacked solid coils. The neck has Alnico V rods; the T-style bridge Alnico IV. Aside from their internal construction, the pickups are active and feature - via a push-switch placed between the volume and tone - multi ‘voices’: either ‘White Guard’ and ‘Black Guard’. The trouble is, with such icons of the electric guitar, we all have our perceptions of how they should sound: we plug in and after a couple of strums think, ‘It’s not the same as my ’52, ’54...’ or whatever. Well, we’re listening to Fret-King here and with these Fluence pickups we’re getting plenty to listen to. First, there’s virtually no hum pick-up. Second, there are the different voices: they’re not like chalk and cheese, but relatively subtle shades of the same. The Country Squire’s dual voices are subtle: the depressed ‘Black Guard’ position of the fast-in-use push-switch gives a slight boost that makes for a rather stylistically versatile Tele-alike in combination with a really fine-sounding neck pickup, which veers towards a smoother humbucker voicing. The thinner ‘White Guard’ voice accentuates the bridge pickup’s twang, but engage the Black Guard voice, add a little grit and here’s a real rootsy sound that seems to cover most of the rocker end of the Tele’s rep. Again, though, with much heavier gain than you’d usually throw at a guitar like this, it just laps it up. With the huge experience and production nous of Trev Wilkinson, Fishman’s Fluence technology and what seem to be extremely competitive prices, we’re struggling to think of a player who couldn’t use this guitar.